Rare Collection of songs recorded by Texas Guitar Slinger,Smokin'Joe Kubek from the 1980's to 2000 from a great collection of Texas Blues Artists. From Doyle Bramhall Sr.Keith Ferguson, Darrell Nulisch,Marc Benno,Al "TNT" Braggs and more! Almost 30 years in the making, BIRD Records is finally releasing “Let That Right Hand Go” a collection of songs and tribute to Texas Guitar ­­­­­­­­­­­­Guru, Charley Wirz. Joined by Texas Blues Greats Doyle Bramhall Sr., Keith Ferguson, Guthrie Kennard, Darrell Nulisch, Marc Benno, Bruce Bolin, Benita Aterberry, Lou ‘Laser’ Bovis, Al ‘TNT’ Braggs, Mark Hickman and ‘Guitar’ Charley Wirz, Joe strips it down to deliver an historical record of the Texas Blues sound available August 28 on iTunes, Amazon.com and CD Baby. Producer Clint Birdwell, of BIRD Records Texas, remarks: “’Let that right hand go!’ was a saying Charley Wirz used to yell at his favorite guitars players on stage wherever that might be. Charley Wirz was a genuine “Guitar Guru” and a guitar player's best friend. Whether you wanted to buy a guitar, needed a guitar repaired, or just wanted to hang out and talk guitars at his small shop on Harry Hines Boulevard in Dallas, Texas, Wirz was the man. One might run into Billy Gibbons, Jimmie or Stevie Ray Vaughan, Bugs Henderson, Gatemouth Brown or any number of Texas guitar gunslingers, because this was the place to hang! One of the best CD's I have heard in a long time. 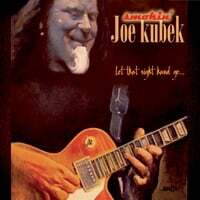 I am a huge fan of Smokin Joe Kubek but this CD puts it over the top. This CD is a must for anyone's CD Library. This is the best new release of old in a long time! Wonderful to hear a session with this may folks recorded in 1984!!!!!!!!!!!!! !